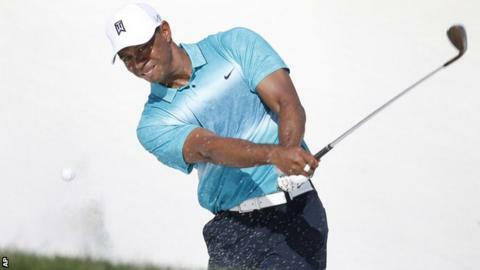 Tiger Woods's hopes of a first PGA Tour victory for two years dwindled as he shot a three-over-par 74 at the Quicken Loans National in Virginia. The former world number one - 266th in the rankings - was three off the lead after two rounds, but made three bogeys and a double bogey on the third day. He is on five under, with leaders Troy Merritt and Kevin Chappell on 14 under. American Merritt shot a 10-under 61 and Chappell carded a 67, while England's Justin Rose is 11 under after a 65. Rose, the world number seven, managed seven birdies in his round. Merritt, ranked 180, birdied 11 holes, including the first five, and only dropped one stroke. "The big thing is we put ourselves in contention and that was the goal," Merritt, 29, said. "I hit the ball really well and got a lot out of it. I think we're going to have a decent chance." The biggest threat to Merritt and Chappell could come from world number eight Rickie Fowler, who shot 68 to move to 13 under. Woods, 39, had shot a 68 and 66 in the opening two rounds. "Basically it was a fight all day," he said. "I was hitting the ball left on the range warming up. I fought through it the best I could."